Should You Watch the Ball All the Way Into the Racket? I've spent most of the last two days in bed with a cold, but I'm over it now. It's fortunate timing as my Mon-Tue schedule is light, while Wed-Sun I'm very busy. There are a lot of segments in this morning's blog as they have accumulated over the last five days. I have no more sicknesses scheduled for this year. Here's a great article on this topic. This happens to players all the time - they reach a comfort level, and then stick with what's comfortable and works at that level, and so aren't able to progress beyond that point. I'm always trying to convince players at all levels to avoid this type of roadblock to improvement. Here are two segments from the article. In the 1960s, psychologists identified three stages that we pass through in the acquisition of new skills. We start in the “cognitive phase,” during which we’re intellectualizing the task, discovering new strategies to perform better, and making lots of mistakes. We’re consciously focusing on what we’re doing. Then we enter the “associative stage,” when we’re making fewer errors, and gradually getting better. Finally, we arrive at the “autonomous stage,” when we turn on autopilot and move the skill to the back of our proverbial mental filing cabinet and stop paying it conscious attention. And so we get to the so-called “OK Plateau” — the point at which our autopilot of expertise confines us to a sort of comfort zone, where we perform the task in question in efficient enough a way that we cease caring for improvement. We reach this OK Plateau in pursuing just about every goal, from learning to drive to mastering a foreign language to dieting, where after an initial stage of rapid improvement, we find ourselves in that place at once comforting in its good-enoughness and demotivating in its sudden dip in positive reinforcement via palpable betterment. How many of you are in the "autonomous stage," where you are blindly sticking to your comfort zone with the things that work at that level, but stop you from progressing? Watch what stronger players do, and emulate that. This doesn't mean you should completely lose what helped you reach your current level; much of that will be useful even at higher levels. The problem is when you rely on lower-level techniques and wonder why you can't reach a higher level. Here's the video (4:33). At the start he's standing on a chair. About thirty seconds in he's on a platform. We need to get something like this at my club. In tennis they start kids at three years old and sometimes even younger, using smaller courts and slower balls. Because of the height of the table players can rarely start in table tennis until they are five or six. There's no reason they can't start by age three if we have either platforms for them to stand on or lower tables. They actually make adjustable tables overseas, where you can lower the table, but they are expensive. Here's the article on USATT Coaching Chair Federico Bassetti. Here's a write-up of the tournament held this past weekend, with a link to a photo album. Here's the article by Barbara Wei. Here's the article on Nobuhiko Hasegawa and Shigeo Itoh of Japan, the 1967 and 1969 Men's Singles World Champions. Includes links to numerous vintage videos. Here's the article. I'm told by many Chinese players that in many Chinese sports schools they spend only one hour per day on school and 7-8 hours on sports. Here's the video (45 sec, including slow motion replay). 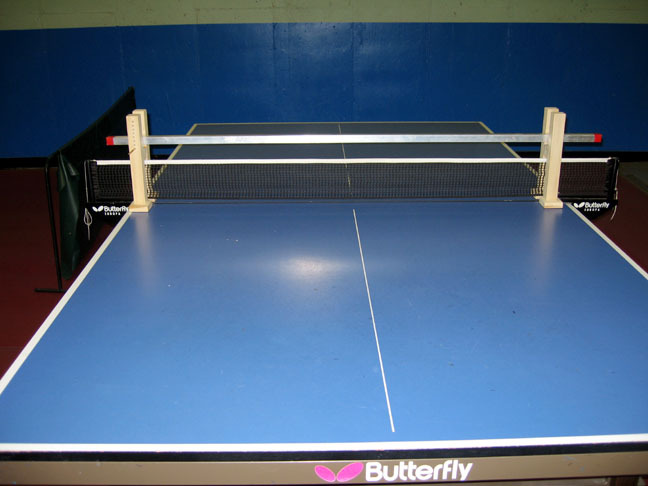 Here's the video (2:24) of a news item on the Triangle Table Tennis Club in Morrisville, NC. Here's the video (7:13) of the exhibition doubles match between David Zhuang/Shao Yu and Ariel Hsing/Erica Wu at the grand opening of Princeton Pong on Saturday. Here's the video (3:42) of the world #8 from Taiwan. Here's the video (39 sec, including slow motion replay). Here are the selections - 65 of them! There's a "Play All" button. Here's the interview, with a link to a hilarious video (1:12). Here's the cartoon sequence. If you're impatient, skip down to the last few pictures! Here's the video (14 sec) of the late table tennis great. Here's the video (1:35) as all-time great Jean-Michel Saive and Jasper Merckx (both from Belgium) lob and spin the table about. Here's the video (3:43) as the twins Coby and Cory go at it in this "ping pong battle for the ages." Here's the original (1:18) as a shirtless Ma Lin serves backspin so the balls spin back into the net, his "ghost serve." Here's Larry Bavly mimicking this (2:30) in his XXL version. It brings back memories of the famous Saturday Night Live Chippendale skit (2:53) with Patrick Swayze and Chris Farley. Here's an interesting thought: I used to believe the way to improve in sports was primarily by reading books! In fact, that's how I got started in table tennis - I was looking for a book in the Track and Field section of the library to help improve my mile running. (I was 16.) Sure, I knew you had to practice, but deep down I thought there were "secrets" that would be more important than actually, you know, going out and running. I had the same ideas when I was even younger (around 12) and tried to become a great baseball player by reading. As one who has written eight books, including six on table tennis (plus 1500 published articles plus 3.5 years of blogging and weekly tips), I want you to believe this as well, so repeat after me: "The way to improve in table tennis is through reading." Say that five times. Now go buy my books. The truth, of course, is that reading does help, but is only one aspect. There are some aspects of table tennis that are pretty much perfect for learning from books, when combined with practical experience - tactics, for example. But whether it's tactics or technique, you need to put in the hours of practice to put what you learn into practice. The primary virtue of reading is it points you in the right direction for what you need to learn, and you then learn it by practicing it, whether it's technique or applying tactics. My original belief that there were "secrets" I could learn from reading was true, it just wasn't a complete answer. I was hoping for secrets that would show me how to do something that would immediately lead to massive improvement, when all that reading can do is point you in the direction of what you need to learn to do - and learning to do it takes a lot of practice, alas. Reading opens doors but you have to go through those doors, and that's the hard part. The new ratings came out a few days ago from the U.S. Open. Our juniors did pretty well. As noted in my blog on Monday, Crystal Wang won Cadet Girls' Singles (15 & Under), and Derek Nie won 13 & Under Boys' Singles. In the newest rankings, Crystal (2384) continues as the U.S. #1 ranked player in Girls Under 13, 14, 15, 16, 17, and 18. Derek "sort of" regains his spot as #1 under 14 at 2336. (The depth in that category is incredible, with at least six players who in previous years might have completely dominated that category - Derek, Jack Wang, Gal & Sharon Alguetti, Victor Liu, Michael Tran, with others not far behind. And just one year ahead of them is Kanak Jha. Jack Wang is #1 in Under 14, but wasn't eligible at the U.S. Open for that because he turns 14 this year.) Tiffany Ke takes over the #1 spot for Under 10 Girls at 1767. Here is a listing of Maryland juniors in the Top Ten (including Virginia players who train at MDTTC). Here are animated gifs of the serves of 19 top players. You should study these and learn a few. Former USATT President Sheri Pittman Cioroslan is doing an article every day during the last 100 days of Adham Sharara's ITTF presidency, counting downwards from 100. Previous ones are linked from the USATT News page, as well as in my past blogs. Fifty-one down, 49 to go! Here's the video (40 sec) by Kento Nomura. Here's a new artwork from Mike Mezyan, but this time instead of a drawing, it's a paddle! He calls it "Ghost in Pajamas," but to me it'll always be "Devil in a Blue Dress." Here's the article and picture of New Belgium Blue Paddle Beer, which features a ping-pong paddle on its packaging. Yesterday's focus was the backhand loop. I again used Nathan Hsu as my demo partner, since he has an excellent backhand loop, far better than mine. (His backhand loop is now his greatest strength - few can stand up to it when he unleashes it.) I demonstrated a few where I'd serve backspin, he'd push, I'd backhand loop, he'd block, I'd chop, he'd push, and then I'd backhand loop again, and we'd continue in this way. Then I had him demo it, both against backspin (multiball fashion) and my block. I also explained a bit on how the game has changed. When I was coming up, the general belief was "one gun is as good as two," and the dominant styles were very forehand oriented. And so I never really developed my backhand attack, and instead focused on forehand attack and a steady backhand. These days, however, most top players attack all-out from both sides. During one multiball session one of the larger players in the camp smacked a ball that hit me smack on the forehead - and it actually dazed me for a moment! I don't think that's ever happened before. I'm glad I wear glasses to play table tennis; I think I'd be nervous otherwise about getting hit in the eye. On Tuesday the younger kids had a blast with the adjustable height device, shown here in a high setting. They had fun with it again yesterday, but now the advanced players discovered it. Two were practicing their serves during break on the lowest setting. 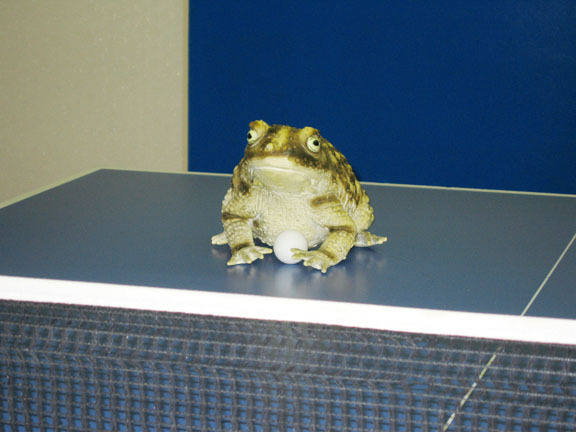 Yesterday I blogged about Froggy, a large rubber frog about the size of a soccer ball that the kids took turns in team trying to hit. Here's Froggy! Here he is from a little further way, from the kids' point of view. After smacking the poor amphibian around for a bit, we ended the day with "Mountain Master," which is our version of "King of the Hill," where you have to win two points in a row from the "Master" to become the new Master. Since about half the players were girls, they rebelled at the name "King" of the Hill! The Washington Post will be at MDTTC this morning at around 11AM to do a special. They will feature Derek Nie (U.S. Open 11 & Under Boys' Singles Champion, already rated 2170) and other players. How can you get news coverage such as the Washington Post and CCTV (see below)? To start with, it is essential that you have a Ph.D in media relations, with many years of practical experience with a large media firm, and you must be trained in the intricacies of exactly how to write a press release in the exact format required or the press will laugh you off. You must also, of course, have the very best players in the country to have any chance of attracting any interest. Yes, I'm kidding. To get press coverage, whenever you run a tournament or league or some other event, or a player at your club has good results, write a basic press release. (Just state what the event or results were, giving names, ages, and where they are from, etc.) Go online and Google local news media, primarily newspapers and TV, perhaps radio. Once you have the contact info, email the press release to them. Wait a few days, and resend or even call. Believe me, local media is always looking for local human interest stories, and it's not that hard to sell them on table tennis. Just make sure you have something that will interest readers and viewers. TV especially is always looking to feature people with charisma. Maryland Table Tennis Center was featured on CCTV American Wednesday night (3:05). While lots of players are shown training, those featured include Coach Cheng Yinghua and players John Hsu, Timmy La, Lisa Lin, and Derek Nie. (They interviewed lots of players and coaches, including me, but alas mine didn't make the cut this time, though you can see me in the background several times.) The video is also featured on the USATT home page this morning. (CCTV American is a Chinese station that broadcasts in the U.S. in English.) And, as noted above, the Washington Post is coming in this morning to do a feature! There was actually a sort of behind-the-scenes spat about this. After seeing the video, a member of the USATT board emailed the rest of the board and staff, criticizing the video and Chinese immigrants for calling the sport "ping-pong." The letter was seen by members of our club, who were pretty unhappy about it. I responded with a lengthy email that basically said "Who cares as long as they are covering the sport, and covering it well," and pointed out all the more important things we should focus on in developing our sport rather than worrying about whether they call it table tennis or ping-pong. (I especially pointed out that it is these very Chinese immigrants who call it "ping-pong" that have developed the large majority of our top players and especially the current horde of top juniors and cadets.) The board member apologized and the matter was dropped. Here's an article from the ITTF on the ITTF Coaching Seminar that USATT Coaching Chair Richard McAfee is running in Champaign, IL. Table Tennis Nation talks about and links to the video (14:47, with the table tennis starting at around 11:00). Bieber is actually decent - check out the topspin backhands he does at 12:27 and 13:47, and especially the behind the back serve he does at 13:54!!! Math professor Larry Bavly is at it again. A few months ago I linked to his video "Lesson One: The Ratings Game" (4:26), where he facetiously teaches the important things about table tennis to a little girl. Now he has come out with "Lesson Two: Mental Toughness" (2:32). I'm about 90% sure the girl is in on the joke. Okay, maybe only 70% sure. PingSkills, which usually does serious training videos that teach serious skills, took a journey to the silly side in this "Will See Won't See Olympic Table Tennis - Invade London" video (4:12), where they play with a shoe, a big paddle, a little paddle, two balls at once, and use the hidden ball serve trick. The Maryland Table Tennis Center will hold its first training camp of the year, our Spring Break Camp, April 2-6. You will be there. Otherwise we will talk about you, and it won't be pretty. The camp coincides with spring break in local schools, which vary from region to region, so we don't get many out of towners for this camp. However, anyone is welcome to join us. It'll mostly be junior players, but all ages are welcome. Coaches will include myself, Cheng Yinghua, Jack Huang, and Jeffrey Zeng Xun. Hours are 10AM-1PM and 3-6PM each day, Mon-Fri. Chinese food is delivered for lunch for $6 (you order in the morning). The club just doubled in size, and will have about 18 tables set up (more if we squeeze), with all-new red flooring, showers, and wireless web. We will be running camps continuously all summer, every Mon-Fri, from June 18 to August 24 (eleven consecutive five-day camps). Come join us! What is the value of a table tennis camp? Most players spend years trying to improve, and it's a very slow and difficult process. The problem is that 1) you might be practicing bad technique, making it even harder later on to fix the problems, 2) you only get to work at various techniques in a sporadic way, and 3) you have other things on your mind and so can't really focus on table tennis. A camp solves all three problems as you live and breathe table tennis all week, learning proper technique from top coaches (as well as getting to see numerous top players demonstrate it), you practice all day long, and your sole focus is table tennis. 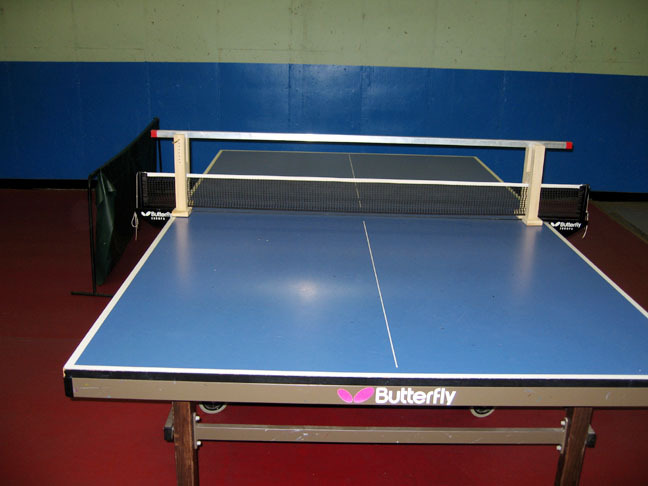 If you are a serious table tennis player, I strongly suggest finding a camp where you can really hone your skills as well as have a lot of fun. 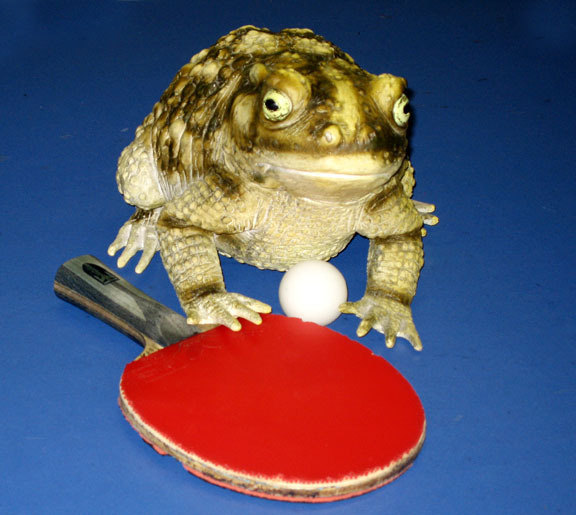 Here's the Federal Association of Sandpaper Table Tennis home page, where you'll find articles, results, and videos of this rapidly growing "underground" sport. (If regular table tennis is an underground sport in the U.S., then is sandpaper the underground sport of an underground sport?) News Item #29 is on the Cary Cup. NPR did a radio interview with Michael Landers, "Ping-Pong Prodigy Seeks Olympic Glory." You can either listen to it (3:51) or read the transcript. I received the following email from Reflex Sports yesterday - so now's your chance to sample their huge video library for free! "We very much appreciate your support of our subscription table tennis video site. Unfortunately, we have not yet been able to get enough subscribers to allow us to continue, at this time, to offer our videos this way. We have finally been able to set up a new site (tabletennisvideocentral.com). This new trial site is offering everything free in the hope of attracting enough viewers to have advertisers." You can download this book for free. The book covers the history of world table tennis. Can you create a high performance environment without spending any money? Sean O'Neill sent me and other coaches a link to this article on the topic. Math and table tennis connoisseur Larry Bavly teaches a little girl all the important things about table tennis (4:26). The best part starts at 1:11 when Larry says, "What is the most important thing to learn to be a good table tennis player?" After the girl incorrectly says, "Placement and spin variations," Larry brings out the chart. They are on the NA Table Tennis home page. It was a great three days at this well-run tournament, though now my mind is sizzled to a crisp from three days of coaching. The JOOLA North American Teams is the most grueling of tournaments. I've noticed there are two types who do well there. The most successful are those who think of themselves as warriors, ready to take on anything and everything, match after match, shaking off all past results as they prepare for combat. However, there's another attitude that seems to work at all levels except the elite level, and that is the "party" attitude. This is the player who plays for fun, and so is completely relaxed when he plays - and guess who wins when he plays an uptight, nervous opponent who so badly wants to win that he rarely does, and whose mind is completely stressed out after a few matches? A player I was coaching lost the first game to a weaker player, and said between games he was nervous. I told him to "Play like it's just another match at the club." It was simple, obvious advice, and it worked. He reminded himself of this the rest of the tournament. It was so successful I repeated the advice to others, and the relaxed wins became infectious. Someone asked me at the Teams, "How do you not care when you do care?" It was a shorthand way of asking how to relax and not worry about winning when you so badly want to win. My answer was that you should be so focused on what you are doing (what serves to use, how to receive, where to place the ball, etc.) and should have convinced yourself so thoroughly that you can do the shots that you need to do, that the idea of losing never enters your mind. You should expect to win, so there is no uncertainty. And if you do lose, when it happens there should be a moment of confusion since it was totally unexpected. Then you shake it off, figure out what you need to do next time, and convince yourself it will never happen again because you know you can execute the shots needed to win. Here's Larry Bavly pulling off the shot of the day at the Teams, at 1:30 of this 2:28 video.